The troubles at Wells Fargo have left women with increasing clout on the board, including Chair Betsy Duke and directors Maria Morris (left), Suzanne Vautrinot, Karen Peetz and Celeste Clark. Men led Wells Fargo & Co. (WFC - Get Report) into the biggest corporate debacle of the U.S. bank's 166-year history. Now, women are taking over. Over the past two years, the San Francisco-based bank has been pressured by regulators and shareholders to overhaul its board of directors following a series of scandals that have collectively cost the bank at least $1.6 billion, sending its stock price plunging. And that shakeup has now put five women on Wells Fargo's board of 12 directors, following an election at the bank's annual shareholder meeting on Tuesday. They include Chair Betsy Duke, who took over last year when former Chairman Stephen Sanger stepped down. She's the first woman to head a large U.S. financial company, according to the company. Four long-time directors - all men - stepped down at the annual meeting, a move that increased the ratio of women on the board to 42% from 33% last year, according to BoardEx, a relationship-mapping service of TheStreet Inc. The new ratio vaults Wells Fargo well ahead of rival U.S. banks on boardroom gender diversity: Bank of America Corp. (BAC - Get Report) has five female directors but 10 men, for a ratio of 33%. 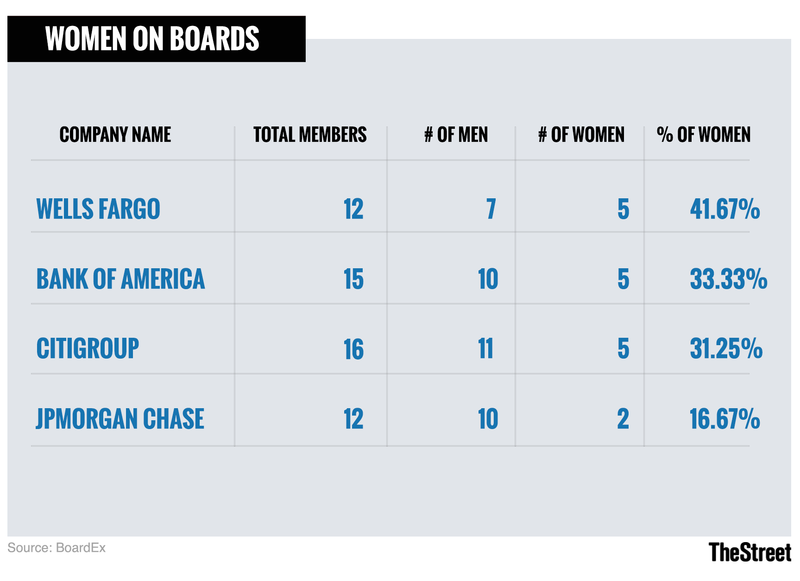 Citigroup Inc. (C - Get Report) also has five women but 11 men, for a ratio of 31%. And women are even scarcer at the very top of the biggest U.S. bank, JPMorgan Chase & Co. (JPM - Get Report) , where CEO Jamie Dimon has repeatedly touted the fact that his senior executive team is 50% female. The company's 12-member board of directors includes just two women, for a ratio of 17%. JPMorgan & Chase is a holding in Action Alerts PLUS. For Wells Fargo shareholders, the increasing presence of women on the board could prove a surprising good-news story following revelations of widespread customer abuses stemming from overly aggressive sales targets established under former Wells Fargo chairmen, including former CEO John Stumpf. Several studies have shown that shareholder returns are better for companies with a higher representation of women on their boards. "You're not supposed to wait for a catastrophe to say, Well it can't get any worse, let's give the women a try," Nell Minow, vice chair of consultant ValueEdge Advisors, which counsels big investors on corporate governance, said in a telephone interview. "But it doesn't take a rocket scientist to figure out that if you're looking through a talent pool of 100% of the population rather than 50% of the population, you're going to come up with better director candidates." Wells Fargo's stock price has tumbled 13% this year as regulators expanded probes into the sales practices and customers and shareholders filed a slew of lawsuits against the bank. In February, the Federal Reserve, which supervises bank holding companies, barred Wells Fargo from further asset growth until it demonstrates improvement in board oversight and risk management. The sanctions came during the final days in office of former Fed Chair Janet Yellen, the first woman to head the central bank. Last week, the U.S. Consumer Financial Protection Bureau imposed a $1 billion penalty on Wells Fargo over allegations that the bank improperly charged hundreds of thousands of auto-loan customers for insurance they didn't need, and for unfairly charging some mortgage applicants when loan approvals were delayed. The Office of the Comptroller of the Currency also cited Wells Fargo for deficiencies in its compliance risk-management program that constituted allegedly "reckless, unsafe or unsound practices." And while it remains to be seen whether the increased presence of women on the Wells Fargo board will lead to improved performance, numerous studies have shown that companies, in general, are more profitable, with higher shareholder returns, when they have a fairer balance of women on their boards. In March of this year, Bank of America's own Merrill Lynch unit found that companies with more diverse boards produced a higher return on equity - another measure of profitability - than those dominated by white men in all but two of the 12 years from 2005 to 2016. Spurred on by such reports, or simply in the name of fairness, big money managers are increasingly pressuring publicly-traded companies to add more female directors, arguing that more diverse perspectives will help foster healthy debate within boardrooms, resulting in more effective strategic decision-making and potentially higher long-term growth. BlackRock Inc. (BLK - Get Report) , the largest U.S. money manager with more than $6 trillion of customer assets, said earlier this year that it wants publicly-traded companies to have at least two female directors on every board. State Street Corp. (STT - Get Report) , which oversees $2.7 trillion of fund assets, says it voted against the re-election of directors at 400 companies last year because they failed to take meaningful action to increase board diversity. The #metoo movement, stemming from widespread revelations of sexual harassment in the workplace, likely has brought additional attention to the gender disparity on corporate boards, according to Minow. Duke, the new Wells Fargo chair, declined to be interviewed for this story through a bank spokeswoman. But in an e-mailed statement, the spokeswoman said Duke is a "big believer in the value of diversity and inclusion." "She continues to be a proponent of the diversity of the board and the senior leadership of the company, with a view that diverse perspectives and experiences challenge norms and create healthy debate and productive change," according to the statement. Wells Fargo still has a man, Tim Sloan, serving as CEO. Duke, 65, a former Federal Reserve governor and bank executive, was named to the Wells Fargo board in 2015. She was joined in the same year by Suzanne Vautrinot, a retired major general and commander in the U.S. Air Force. But the shift toward giving women a bigger role on the board accelerated after the sales-practices scandals exploded into public view in September 2016; that's when the Consumer Financial Protection Bureau and other regulators fined Wells Fargo $185 million over the opening of millions of unauthorized accounts. Stumpf, who had served as chairman since 2010, came under fire from lawmakers including U.S. Senator Elizabeth Warren, a Massachusetts Democrat who famously grilled him during a congressional hearing over his reluctance to hold himself accountable for the oversight failures. Reeling from his widely-panned responses during the televised hearing, Stumpf stepped down as chairman in October 2016. The board elected Stephen Sanger, a former General Mills Inc. CEO who had served as a director, as independent chairman; Sloan was named CEO. Then the following year, shareholder pressure to make more sweeping changes became so intense that Sanger agreed to step down; Duke was named to take his place. Karen Peetz, 62, a former Bank of New York Mellon Corp. (BK - Get Report) executive, was hired in February 2017 as a new independent director. Then in November of last year, the bank added Celeste Clark, 64, a former executive of cereal maker Kellogg Co., and Maria Morris, 55, a former head of technology and operations at the insurer MetLife Inc.
At the end of 2017, the Wells Fargo board had five female directors, or fewer than a third of its 16 members. But in February, the Yellen-led Fed brought the hammer down. Wells Fargo was banned from growing assets beyond its current level of roughly $2 trillion until board oversight was improved. Just two weeks after that, Wells Fargo announced that four longtime directors, all men, would step down at the annual meeting. That final phase of the shakeup, delicately described by Wells Fargo as a "board refreshment process," greatly strengthened the power of the female directors, boosting their collective share of board seats to the current 41%. "Boy, given all the changes that are needed at Wells Fargo, they really need these new women directors to step up to the plate," Minow said.